Finally, modders will have the full toolset available to create whatever they wish in Skyrim. When Oblivion was released in 2006, Bethesda put nearly all of their software tools used to create the game on the disc. That was not the case for Skyrim's release on November 11th, and Bethesda didn't say when such tools would be made available to the public, if ever. Thankfully, today the company announced that the toolset - dubbed the Creation Kit - will be available for download sometime in January. Further, the Kit will hook into Valve's Steam Workshop which will allow modders to share and rate other people's mods much easier than collating them from various mod websites. Oh, and those pesky backwards flying dragons will be fixed as soon as is humanly possible. "Beginning in January, PC players will be able to download the same development tools we used at Bethesda Game Studios to create Skyrim," reads the post on the Bethesda Blog. 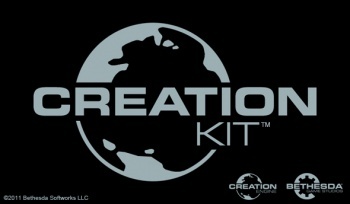 "In tandem with the Creation Kit's release, we will roll out a new Wiki and videos to help you get started." The Steam Workshop integration sounds cool because you'll be able to pick mods from any device connected to the web, and those mods will download when you boot up Skyrim on Steam. "Like a live Netflix queue, when you fire up Skyrim, mods you flagged will be automatically downloaded and installed." The post also outlined the plan for future bug fixes and kinda-sort explains/apologizes for the bugs in Patch 1.2 as they prepare the next update. "Among other things, the update will fix issues like magic resistance not calculating properly and the rare, amazing backwards flying dragon," the post read. "We've also realized that with the millions upon millions of people playing Skyrim, we need to treat our updates with greater care. If we get too aggressive trying to fix a minor issue, we run a risk of breaking something larger in a game like this." PC players take heart, Bethesda will be rolling updates out to you much faster than your console brethren. "We'll be releasing an incremental update next week. We anticipate it will be up on PC first, and then hit PS3 and Xbox 360 later in the week. Overall, you should expect updates to be hitting the PC and Steam earlier and more often, as that's a process we control. Console updates will follow, as they must be certified and processed by those manufacturers." While Skyrim certainly isn't bug-free, I haven't experienced any of the soul-crushing glitches that so many others have. Hopefully, any issues people experience will be patched out as quickly as possible. If not, the modders will be able to fix them when the Creation Kit lands in January.